And why try to force a new format when good old DVDs are still good enough for a large portion of the market? "A lot of people feel they can watch their DVDs and have a nice home theater setup, and it's working just great for them," says Angelique Flores, Managing Editor of Home Media Magazine. "They don't feel any need to move over to HD. ... It's not like the difference between DVD and VHS." Many people with HD sets are finding that new player technology can provide a good high-def experience with their current library of standard DVDs. "The up-converting DVD players are getting a lot better," Enderle says. "Chances are no one's even gonna know the difference." But while DVDs might be good enough for now, the format won't reign forever. "I think as people buy these beautiful, widescreen HDTV sets, they're all starting to realize that getting true HD content does make a difference," Kaufhold says. "There are people that have four or five of these widescreen TVs in their house already, so they want to have HD content on all of them. ... Even grandma's going to have an HDTV in a year or two." 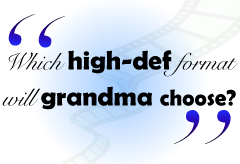 So which high-def format will grandma choose? Well, she might just skip the battle altogether and download her movies directly, as she already can through services like Xbox Live. "What Microsoft sees as strategic is movie downloads - and they get a royalty for those," Enderle says. "[Microsoft] seems to believe, as many of us do, that [downloads] represent the real future; that HD DVD and Blu-ray both are sort of transitory technologies until people figure out how to do downloads, and once they do we'll take the next step." Then again, once they figure that out, the format war may be a moot point anyway. "Eventually the cost of manufacturing dual-disc players will be not dramatically higher than single-format players," Kaufhold says. "For about the next 12 months, if you're a gamer who also likes movies, the PS3 is the best bet. Within the next year, though, it's going to be come a player business, not a videogame console business. When it becomes a player business, the dual-mode player is the right choice for most consumers. ... The endgame is we probably still have HD DVD and Blu-ray movies, but if the average consumer has a dual-mode player, it won't really matter." But the scariest option for the high-def movie market might be perpetual war - a generational cycle of new formats and players that starts to resemble the videogame industry. "There are actually two new [movie disc] formats lining up after this," Enderle says, "a lower cost high-definition format's been proposed by a U.S. company that looks like it can come in substantially below HD DVD and Blu-ray, and China has a play that they're going to make. ... This is kind of the last Christmas where we'll be standing around with this fight, one way or the other."